This event was and is rightfully considered a watershed moment in the Republican Party’s attempts to destroy unions and the union movement. Since Reagan took on PATCO, unions have seen their membership number decline precipitously, and most working class Americans have seen their wages and salaries stagnant, even as the individuals (CEO’s, Senior executives, and people like Mitt Romney and his former firm Bain Capital) who control major corporations and industries have seen their pay and income soar to levels once though unimaginable. Dear Mr.Poli:I have been briefed by members of my staff as to the deplorable state of our nation’s air traffic control system. They have told me that too few people working unreasonable hours with obsolete equipment has placed the nation’s air travelers in unwarranted danger. In an area so clearly related to public policy the Carter administration has failed to act responsibly. You can rest assured that if I am elected president, I will take whatever steps are necessary to provide our air traffic controllers with the most modern equipment available and to adjust staff levels and work days so that they are commensurate with achieving a maximum degree of public safety. As in all other areas of the federal government where the President has the power to appoint, I fully intend to appoint highly qualified individuals who can work harmoniously with Congress and the employees of the governmental agencies they oversee. I pledge to you that my administration will work very closely with you to bring about a spirit of cooperation between the president and the air traffic controllers. Such harmony can and must exist of we are to restore the people’s confidence in their government. 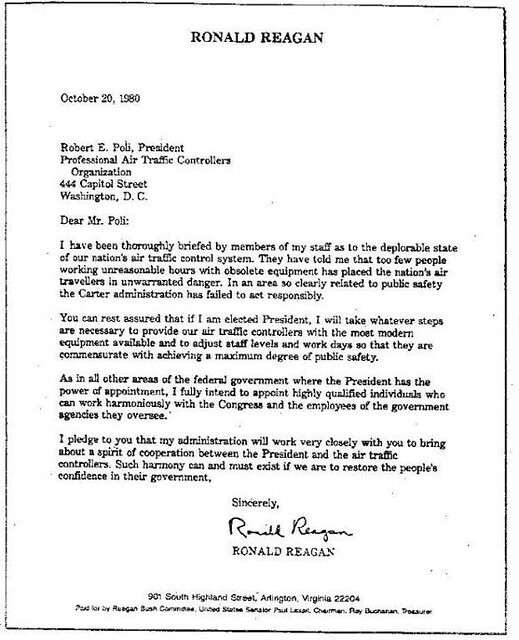 Based in part on this this letter Poli and other senior PATCO officials had PATCO endorse Reagan for President. PATCO was one of only four AFL-CIO affiliated unions to endorse Reagan over Carter. [N]ewly elected PATCO president Robert Poli—who’d succeeded the more irenic incumbent John Leyden in a surprise insurgent challenge—was keen to demonstrate his clout before the union’s restive rank and file. He presumed to be bargaining from a position of strength because during the run-up to contract negotiations, PATCO had sought to secure firm Washington backing with another surprise move: it endorsed Reagan in the 1980 election, partly as a matter of heeding the shifting national mood, and partly out of sheer exasperation with the Carter administration’s handling of key controller concerns. Never has a Union leader made a more serious mistake in judgment. The Reagan appointed head of the FAA failed to negotiate in goof faith, reacting to PATCO’s demand for pay raises, improved equipment and less arduous working hours with a counteroffer equal to approximately 1/7 of the cost of the union’s offer. Poli accepted the offer, but did so with little enthusiasm. Reagan had doubled crossed him and put his position with PATCO’s membership at risk. The administration’s hard line only encouraged those at PATCO to strike, which was Reagan’s goal all along. He immediately invoked the Taft-Hartley act and fired all the striking air controllers on August 5, 1981, a total exceeding 11,000. Reagan then hired 5.500 scabs as the FAA head, Drew Lewis claimed that there had been a “surplus of controllers.” The FAA also reduced flights by 25% and also brought in 370 military controllers. Though the FAA promised to have staffing levels up to pre-1981 levels within two years, in fact it took almost a decade before those levels were again achieved. This was due partly to Reagan’s ban on rehiring any of the fired PATCO controllers. Today, of course, the Republican candidates feel free to openly demonize unions and seek to destroy the right to collectively bargain. We’ve seen the actions of Republican governors elected in 2010 as proof of that. The nation’s political landscape is vastly changed by what Reagan accomplished in his showdown with PATCO. Reagan gambled that he could get away with his lies back then, and he succeeded. Now Republicans can lie on a daily basis and no one in the media even bothers to check the claims they make, the numerous falsehoods and prevarications they promulgate. Now the unions are shrinking, and they more often than not refuse to strike our of fear. Now Democrats govern as 1990’s era Republicans, catering far to often to the wealthy elites and multinational corporations and failing to support unions. And it all started with Ronnie Reagan’s sweet little lie to the air traffic controllers. He wasn’t concerned about the safety of air travel. He wasn’t willing to work with PATCO to improve working conditions or modernize our air traffic control system. He wanted an easy target to make the case that unions are bad for America, and he hoodwinked PATCO into believing he would act honorably and treat them fairly. He lied, and we have been paying the price for it ever since. ORIGINALLY POSTED TO STEVEN D ON MON JUL 09, 2012 AT 11:39 AM PDT. ALSO REPUBLISHED BY KOSSACK AIR FORCE AND IN SUPPORT OF LABOR AND UNIONS.